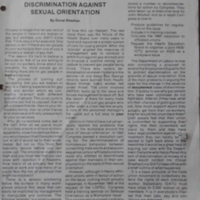 Article by Donal Sheehan on Discrimination Against Sexual Orientation in Distributive Worker Newsletter - Official Organ of the Irish Distributive and Administrative Trade Union. The article addresses discrimination faced by LGBT people in the workplace and the role that trade unions can play in protecting LGBT workers' rights. Digitising these community resources in a publicly accessible digital archive can be seen as fair dealing and reasonable use of these materials (as defined in the 2000 Irish Copyright Act) and in keeping with the ethos and purpose with which they were produced. In addition to this, Permission to Use has also been granted by the owners of the collections and by the relevant community organisations. Items in this digital archive are covered by a Creative Commons Attribution Non-commercial No-Derivatives License. Please credit Orla Egan, Cork LGBT Archive and provide a link back to this site. 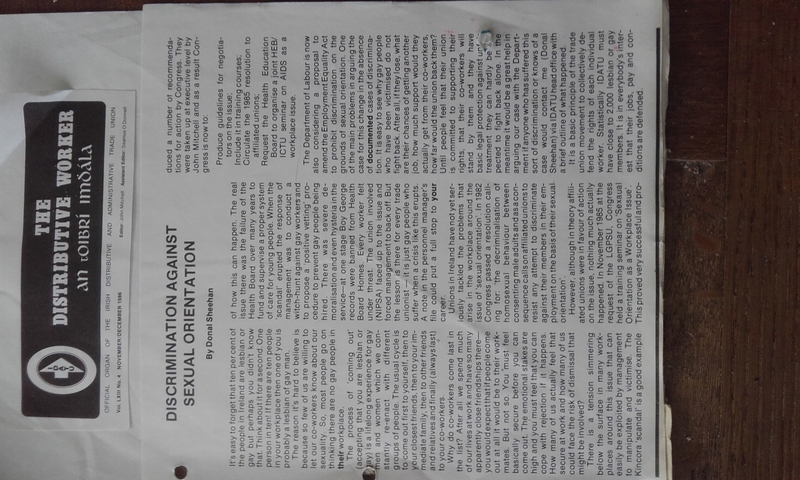 Donal Sheehan 1986 Article in Distributive Worker Newsletter,” Cork LGBT Archive, accessed April 19, 2019, http://corklgbtarchive.com/items/show/181.